Google recently announced a new Google Assistant feature: the ability to make P2P payments money transfers to your friends as well as request cash using voice and Google Pay. The feature is one of a number of others in the market and is a growing trend that will work not only on Android smartphones and tablets, but also on iPhones — as long as Google Assistant is installed on your iOS device, courtesy of the Google app. In the future, smart speakers will also get the functionality. Users can tell Assistants to send money through the standard voice interface — the recipient needs to have a Google Pay or similar account also — and then authenticate the transaction using their phone with a fingerprint or by entering their password. Users who don’t have a Google Pay account are prompted to set one up the first time they initiate a transfer. The P2P market is growing: Business Insider Intelligence estimates that mobile P2P volume will hit $336 billion in 2021, up from $19 billion six years earlier. 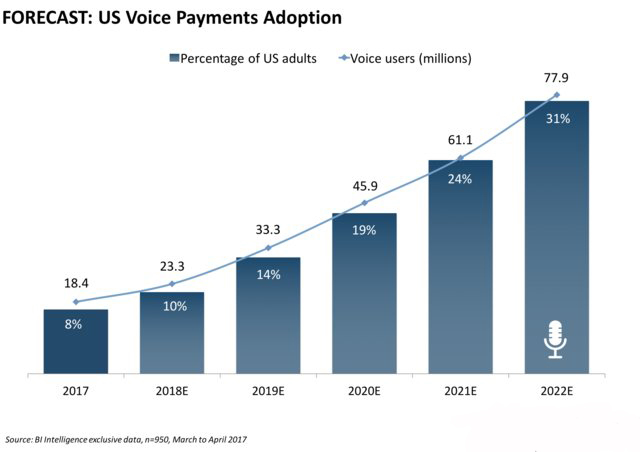 And voice payments are on the rise as well — US voice payment usage is expected to grow fivefold through 2022 — at the same time that popular voice assistants like Apple’s Siri and Amazon’s Alexa have added or are exploring P2P capabilities. Assistant has a wide user base, as it’s installed on 400 million devices, comes pre-installed on Android phones, and has an iOS app, so it could be a popular use case for P2P because of its convenience and simplicity. That could bring more customers to Google Pay. Google Pay is sorely in need of growth. But Android Pay’s recent rebrand to Google Pay, which made numerous improvements, likely won’t be enough on its own for the mobile payment offering to see a sudden increase in adoption. Just 11% of eligible customers had tried Android Pay, making it the lowest-adopted of the three major phone-based services when compared with Samsung Pay and Apple Pay. The service also counted the worst engagement rates among these players. If the convenience of voice-based P2P payment function draws more people to Google Pay that could increase the number of customers who test the wallet for other use cases, like in-store payments.